Since 1994 we’ve brewed all sorts of exciting beer styles. In 2001, we bought our building – which used to be an old dairy processing plant – and set out for over a decade of exponential growth. Our brewery has become what it is today thanks to our hardworking, creative and passionate employees. Here at Great Divide, Bold Character is more than just a catchphrase, it’s the philosophy behind what we brew, how we think, and what we believe. In many ways, Ratio started in the punk scene back in the late 90’s. We cut our teeth by touring, playing out, creating zines, and working at labels. That DIY mindset prepared us for the challenges of creating and sharing our passions on our own terms. Over the years that energy has been channeled into brewing, learning the craft in Germany and honing our skills at some of the most respected breweries in Colorado. 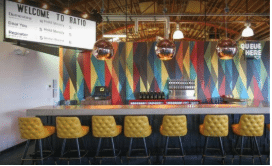 After moving on to successful careers in brewing, marketing, and finance; we have teamed up again for our most ambitious project yet – Ratio Beerworks, a Denver micro-brewery. Society tries to steer you down a very defined path of norms. Some might say this is the road most traveled, made of bricks that have been compacted with the footsteps of mindless cooperation. Go against the grain, find your own path, and when you need inspiration always look to the ones in black. 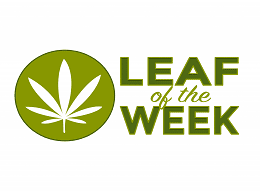 They are the rule breakers, the non-conformists, and the counter culture. Black Shirt isn’t just our name – it’s our philosophy against convention and homogenization. It’s who we are, who we call our friends and what we strive to be – the ones that challenge the “norms” of the craft beer industry. 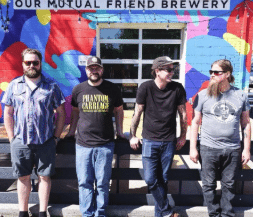 Our Mutual Friend Brewing creates a place for community through their small neighborhood taproom in the up and coming River North (RiNo) neighborhood. Their vision was to create beers with a sense of place. Forging relationships with Colorado hop and barley growers and has allowed them to offer as many 100% Colorado grown beers as possible. 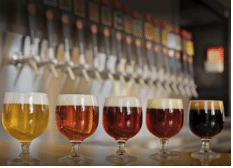 Among their medals earned are a silver medal in the wood and barrel aged sour category at the Great American Beer Festival for a 100% Colorado mixed-culture fermentation barrel-aged sour beer, and back to back silver medals in the brett beer category. We love the Denver lifestyle and wanted to create a brewery that matches our city’s personality. 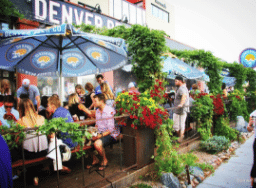 Denverites work hard, and play even harder. And after a long slog at the office or a gnarly mountain bike ride there is nothing better than a friendly place to sit and relax with friends and a pint. We welcome both oxford shirts and dirty shorts. Dogs are welcome too. 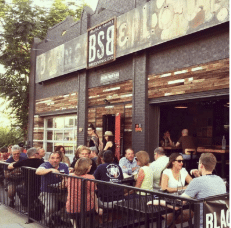 Denver Beer Co is a community where patrons will likely meet a new ski buddy and swap scar stories with strangers. Inspired by a bike trip through Belgium, maker of Fat Tire Amber Ale and a wide variety of award-winning beers, it’s the third-largest craft brewer in the country. A 100% employee-owned brewery recently named the nation’s best brewery tour by USA Today’s 10Best. 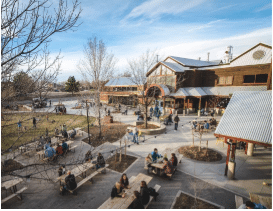 New Belgium Brewing made social responsibility an important part of the brewery’s mission. About 15% of the brewery’s power comes from methane gas created as a byproduct of their on-site water treatment plant. An additional 3% comes from a 300kW solar array on the brewery’s packaging hall in Fort Collins. The brewery also uses an energy-efficient kettle for the brewing process. The Steinecker Merlin kettle heats twice as quickly by boiling thin sheets of wort in the entire kettle at once. This provides significant savings in natural gas consumption. Their vision is making world-class beers while minimizing its environmental footprint. De Steeg Brewing - Entrance in "The Alley"
Jagged Mountain Craft Brewery, L.L.C.